Photos are all about lighting & without clear pictures, Its rubbish! Indeed, Best memory need best selfie with vibrant picture. So this little light is all about making your selfies not best but ultra-perfect! The light gives soft illumination without harsh light. 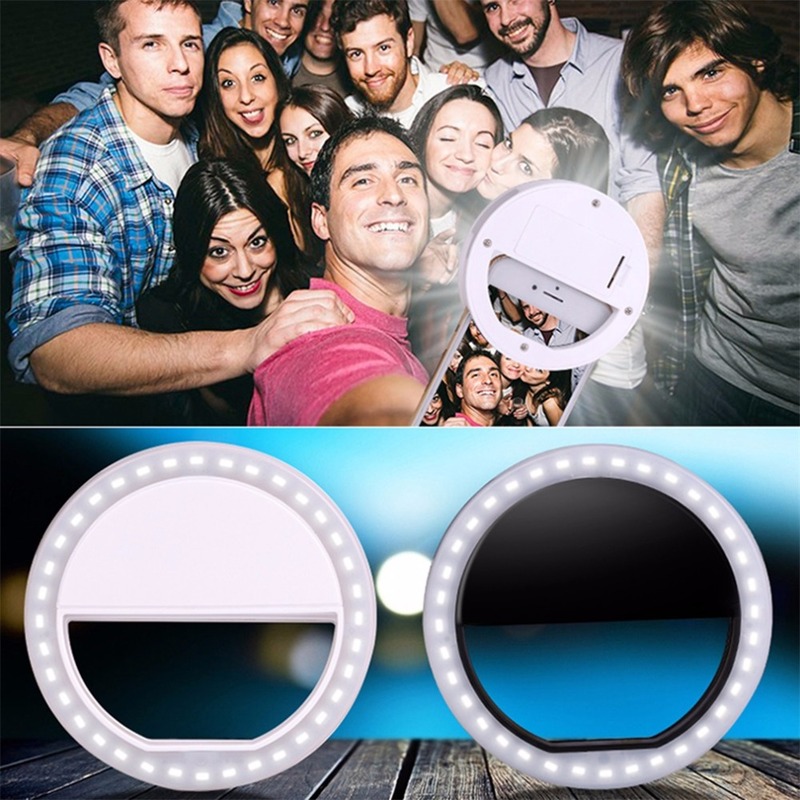 It’s Amazing to find the perfect lighting needed for the photos with this ring LED light suitable for most smartphones; great at parties or camping trips. It has Brightness Adjustable option with Three-level light settings for various uses -- make-up, selfie photos, dark scenery vlogging etc. Let this ring light highlight you and darken everything behind you. Everything is fine. Product matches Description. It works!!! Photo quality became higher. Runs on three levels brightness. Easy operation. Small, Handy item. Recommend. Product same as indicated on the page. In perfect state and not take so long. Class! I enjoy! Just ask to better. AND then come to such a box. Month to Komi went. Good product. The packet has been the worst came foremost spoiled and without any protection, nevertheless, as described by. Excellent light, thin, firmly attached, shine bright. Delivery two weeks. Recommend! Thank You Very Much. Left new lamp with charging and the right of the old lamp battery powered from other seller, difference is obvious. Thank you very much, all together, 3 modes brightness. Plus charging cable in box. Fast shipping. 5 stars! Product same as described, good quality, quickly came to Brazil. Has really 3 levels of brightness and light very well, very value the pictures in darker environments. Product went beyond expectations. Seems like a good quality devise. I'm very satisfied with my purchase. Thank you seller! Very fast delivery to Romania (<1 month). Thanks! Great item for a very low price. It works perfectly. I am very happy with this purchase and I do recomend this seller. Excellent product extremely fast. The light has 3 intensities perfect! Recommend the seller. The light is super. Elle s'accroche very well to portable. 3 light level. Awesome. I recommend. Arrived very quickly. Loved great quality. Very attentive. Order came quickly, about 18-20 days To Track all the way. All three modes work great. See how to use. Happy, recommend. Arrived grated why it was loose inside the package, it works perfectly. Arrived very fast, all right until then, as the description, came loaded so have not tested the charger. After sending the faadback. Congratulations arrived very fast, in 25 days. Super satisfied. Has three modes of light. Absolutely love this light. It is so sooo sooo bright. Arrived soon. Love it. Will order more. Love it. Comes with a cablee to charge it, no batteries needed. Super fast shipping. 3 different light adjustments. Great buy! Vsichko nared with porchkata vpreki che non byaha opakovani. Prodavach sociable. This is great! Works as described! Has 3 different lighting settings too! Also comes with a charger! I loved. Wonderful. It has three intesidade light and comes with USB to recharge. Love. It’s super cool! Really useful for me. shipping, good quality. Thank you! all great. box помятая has come true, is not strong carton, all but whole. prewired came. three mode work. satisfied daughter. thank you so much seller. the description and las Is exact. arrived after 3 mos But delay Shipping debió be custom and blame my country. all is excellent. price is for годная piece. satisfied wife, so-recommend. Items came faster than expected. Nice job seller. You did well. В Москву пришло за 3 недели. Коробка была очень сильно помята, но все работает. Продавца рекомендую. Maravilhoso, perfeito, de ótima qualidade, único problema é que pedi branco, veio preto. Muito melhor do que eu imaginava! Feliz com minha compra. fast shipping, the lights all working. La descripción del producto es exacta. La iluminación es genial. No le coloco las 5 estrellas, porque el tiempo en llegar fue demasiado. produto como descrito, chegou dentro do prazo, produto com arranhões, mas no geral satisfeita! arrived exactly as no anuncio, i'm super satisfied with the product, highly recommend. As described, but in pink, but nice. 3 levels of light. take the second time. good thing. 3. battery. on our замяли mail. all but whole. 21 arrived ordered on don rostov in may 2, itself is very fast! enough flash bright, inferior greatly front camera light standard S7 galaxy tried on this ring. hole is light and flash light gives more is much better.